Unmatched Reliability - Penske’s rental trucks are always late-model and they’re well maintained to ensure your next move goes great. Unlimited Miles – Penske offers free, unlimited miles one-way moves, which can save you a lot of money when you’re moving a long distance. Great Locations – With thousands of locations Penske offers many convenient and easy locations to pick up and drop off your rental truck. Towing Options – Planning to tow your car during your next move? Penske has the reliable equipment you’ll need to tow your vehicle behind their truck. Moving Supplies – Penske offers everything you’ll need for your next move including bubble pack, moving boxes, tape, locks, and much more. Constant Support – You’re never traveling alone with Penske Truck Rental. They offer around-the-clock roadside assistance every day of the year should you ever have any difficulties during your move. Self-Storage Savings – Be sure to ask your Penske representative about great savings options available to Penske Truck Rental customers on self-storage units. 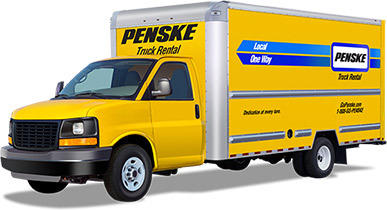 Visit Penske Truck Rental to reserve your truck, today.